SAN DIEGO (AP) Ian Kinsler finalized an $8 million, two-year contract Thursday with the San Diego Padres, who cleared space on the 40-man roster by designating veteran left-hander Clayton Richard for assignment. It's expected that Kinsler will play second base, allowing rookie Luis Urias to play shortstop until top prospect Fernando Tatis Jr. arrives in the big leagues sometime during the 2019 season. Kinsler will make $3.75 million in each of the next two seasons. The Padres hold a $3.5 million option for 2021, with a $500,000 buyout. 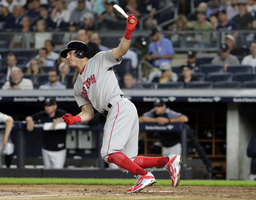 Kinsler, 36, won his second career Gold Glove Award last season, which he split between the Los Angeles Angels and the World Series champion Boston Red Sox. The four-time All-Star batted .240 with 14 home runs and 48 RBIs in 128 games. Richard, 35, was 7-11 with a 5.33 ERA.